In June 2000 our understanding of the "Face" was improved when the graphic artist Mark Kelly published an improved rectification of the foreshortening in the 1998 MGS image. An explanation of how he achieved this can be found on the Meta Research website (click this "stargate" µµµ). 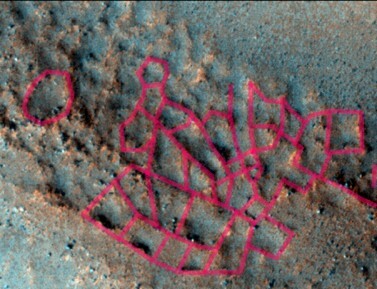 The basic technique involved using the 1976 Viking images as templates with which to shrink or stretch portions of the 1998 image to simulate what a completely overhead shot would look like. 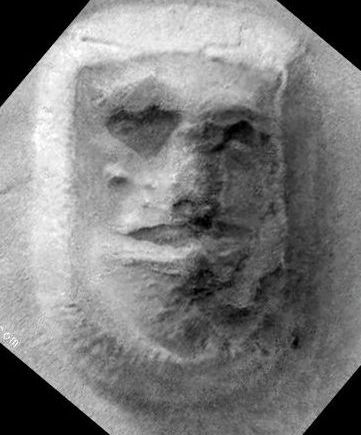 Kelly also adjusted the lighting direction in the image to match that seen in the first of the Viking images. As a result Kelly's picture (seen below on the left) gives us an idea of what Viking would have seen in 1976 if it had carried a higher resolution camera. I believe that Kelly's picture does give us a near perfect representation of the actual three dimensional relief of the "Face". However, as different parts of the surface on the "Face" appear to reflect light differently, light and shadow effects in an actual overhead image by the MGS might be more difficult to discern. This new rectification confirms the unusual architectural looking qualities of the "Face" platform. It also confirms the "Ape-man" and "Lion" dichotomy between the West and East sides of the "Face". Mark Kelly's graphical work can be found at the Electrobus website, µµµ. Early 2001 saw the launch of the Mars Odyssey spacecraft. It also saw the release of a new high resolution MGS image strip running through the western side of the "Face". It was as if someone had taken the Enterprise Mission's prophesy that 2001 was a "year of disclosure" to heart. The picture on the right is a much reduced, enhanced version of this second MGS "Face" image. (If the reader uses the "view" then "full screen" option on their browser control bar then they should be able to see all of this image on the screen at once). Access to the original MGS image is available here µµµ. The new image (as published) is very lacking in contrast and is very "noisy" in appearance. The lack of contrast is easy to deal with. However, smoothing out the "noise" from the image also means smoothing away finer details in the image too. I've found that the best results are to be had by smoothing away the "noise" in the image. So the reader should be aware that this means that the actual level of resolution in the following images is less than the notional 1.7 metres in the original image. The first surprise in this higher resolution image is just how shattered and complex the surface of the "Face" is. It looks like something crumbling and falling apart. If it is a natural formation made of solid rock, then 2 billion years of dust blasting have not produced a smooth surface like Ayr's Rock in Australia. Nor has the surface been eroded into weird scalloped shapes like I've seen in some areas of Mars where there appears to be complex sedimentary layers. The underlying "building block" for the "Face" appears to be just that - angular, often rectangular blocks. The image on the left is a sample from the smoothest, flattest part of the "Face" platform magnified by a factor of three. (I've used a GIF file image to cut down on confusing compression artefacts). Even here the surface is made up of blocks. Now rectangular blocks are not unusual in geology, but they are also an aspect of building techniques. The important thing is, is that if the "Face" had smooth or random surfaces, then this would point to it being made of solid rock. A composition of solid rock would be highly indicative that the "Face" is a natural formation and not a ruin. As we move along the top of the western "Face" platform to the areas close to the "mouth" we find that the surface subsides down into a grid of building sized pits. In the original version of this webpage the image enhancements of these features were not very satisfactory due to the "noise" levels in the data. When reviewing this page in 2013 the decision was taken to "cheat" by "going back to the future" and replacing the 2001 images with false-colour pictures taken by the MRO spacecraft in 2007. The first of the replacement images shows part of the "Face" platform collapsing down into the lower honeycombed levels of a possible artificial structure. The second image is an attempt to show the somewhat grid like nature of the pits and partitions that this has created. (This article continues below the next two pictures). Eye! Eye! What's this here then? The aspect of the "Face" image strip released at the beginning of 2001 that caused most excitement was that it captured the "eye" of the "Ape-man". The images below show the area around the "eye" enlarged by a modest 40%. It confirms the bulging feature surrounded by a depression seen in the 1998 image. However, the assumption made so far in this article that the bulge might represent a "pupil/iris" and the depression the "white of the eye" may be wrong. If the "Face" is a mammoth sculpture then the bulge may be the "pupil" and the surrounding depression the "iris". 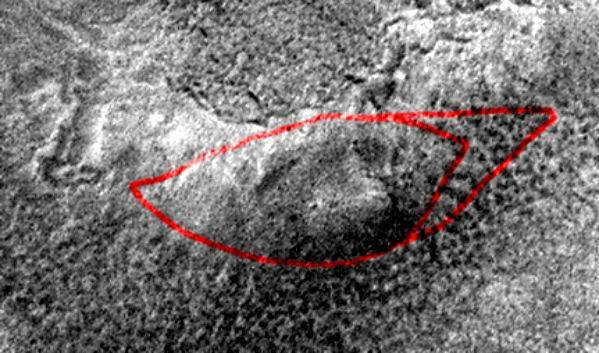 This possibility arose after Curt Jonach of the Electric Warrior website pointed out that faint grooves encompassed these features with an eye shape. Jonach shaded in this proposed "eye" without showing the grooves. Without referring to Jonach's work, I've examined the first of the two images below and drawn over in red the grooves that appear to form the outer boundary of an eye in the second image. As can be see I've explored two options. Once one sees this larger boundary to the "eye" it is even possible to see it in the reduced picture of "Face" that began this study of the January 2001 image release. (This article continues beneath the next two pictures). The area around the eye required very little smoothing in these enhancements. There is much detail around the "eye" that is consistent with the theory that the "Face" is a gigantic constructed sculpture. (As this image is not very enlarged or "smoothed" it can be viewed close up by the reader if necessary). The most obvious feature is the eroded latticework effect running below the "eye" which looks like the exposed remains of an underlying structural support. The "brow" above the "eye" appears to have been sheared off to reveal a criss-crossing interior of angular blocks. The large enclosures to the top left of the "eye" in the "temple" area also look interesting. 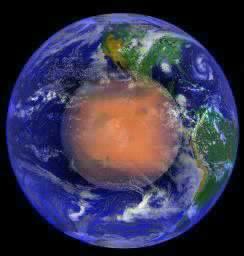 However, given the shattered and highly eroded nature of the hypothetical "mars-crete" with which an artificial "Face" is likely to be built, it is difficult to see how artificiality can be proven in relation to the competing natural hypothesis. The only sure-fire way would be if we could somehow see into the interior structure of the Cydona "monuments". In the 1998 image of the "Face" the most apparent possible structural features were to be seen in the "nose" and "mouth" areas. Maybe if these were captured in a clear, high resolution image we might see things that look even more strongly like ruined structures. As I finish writing this section at the beginning of May 2001 the Mars Global Surveyor is still orbiting Mars and snapping pictures. So far Dr. Michael Malin (who owns the MGS's high resolution camera) has been very reluctant to take/publish images of the "Face". However I suspect very much that this is a story.......to be continued .....and of course it was. Click the next link for Part Four.